To truly look at one of Russell James’ iconic photos, be it a portrait of a beautiful girl or a moody shot of a stunning landscape, is to be awed by the very real sense of intimacy that emanates from the work. An interesting factoid is that the Australian photographer, perhaps best known for the lush images of gorgeous women he shoots for Victoria’s Secret, is also infamous for his habit of going barefoot whenever possible. After all, what more literal manner is there of grounding ones’ self, of experiencing the land in which one happens to be standing at any given moment? Fantastically well executed lingerie shots aside, Russell’s most evocative works, and those that reflect his life’s passion, are far less commercial. Russell embarked on what he calls his “Nomad Two Worlds” photography project in 2001. Since then, he has continued developing the subject through collaborative works—namely photographs painted over by indigenous artists—that have been exposed in prestigious spaces and events all over the planet. Initially, the “two worlds” referred to the Australian photographer’s home continent: torn between an until-recently covered up aboriginal past and the tensions of the present day. Soon, Russell expanded his concept to include other countries and cultures, such as Haiti and the Seminole tribe native to the South Eastern United States. The project intends to act on a global scale, and its collaborative nature is meant to aid in working together to enable a culture in flux to heal and to move forward. The Two Worlds series now also includes video, as Russell explores other art forms as a means of getting his message across. Next, branching out even more, Russell furthered this ideal of creative collaboration with Raw Spirit, a growing collection of unisex fragrances—there were six at press time—devised in part with the help of Dr. Richard Walley, artist and spokesperson of Western Australia’s Noongar people. More recently, collaboration with the Native American Chumash Indian Museum in California furthered the Raw Spirit journey. Considering Russell’s background as one of the most accomplished photographers of our time, it comes as no surprise that the images that accompany the fragrances’ marketing materials would be integral to the project. Namibian supermodel Behati Prinsloo, who has worked with Russell on Victoria’s Secret shoots, was chosen for her natural beauty, energy, and, yes, spirit, and was shot in the dramatic natural setting of the Seminole Tribe Lands in Florida. Also shot on the Seminole Tribe’s land are an arresting collection of grainy, moody, sepia-toned art photographs. The series was the result of Russell’s meeting James E. Billie, the Chief of the Seminole Tribe, and being given full access to the Tribe, its lands, and its traditions. This project previewed at the CameraWork gallery in Berlin this past spring. The Raw Spirit business model, which truly aims to be collaborative and have a long-lasting beneficial effect on indigenous tribes, is quite impressive in its own right, but the scents themselves are even more so. Technical collaborations with experts, such as the well-known “nose,” master perfumer Harry Fremont from top fragrance house Firmenich, have obviously paid off. This is not a mere fashion-world experiment or random fund-raining effort using sub-par products that are expected to sell because of the cause to which they are purportedly attached. Even if Raw Spirit were not so committed to being socially responsible, the highly evocative, high quality scents would stand for themselves. 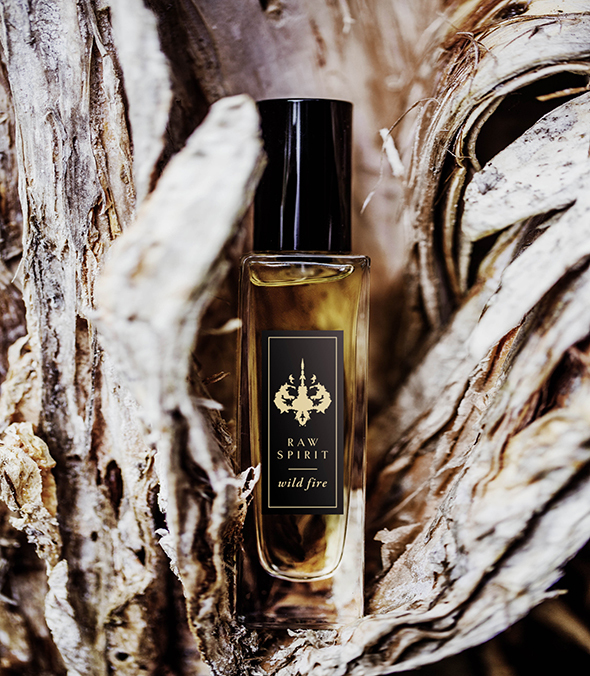 Fire Tree, the first Raw Spirit fragrance, derives its unique smoky-sweet nose from wild-harvested, extremely precious Fire Tree oil, which is collected with the approval and aid of the Noongar tribe. There are two other scents inspired by Australia: the first, Wild Fire, is the driest, woodsiest scent of the collection. Wild-harvested Australian sandalwood goes on subtle and then builds, with floral notes rounding out the bouquet, like a haunting afterthought. Desert Blush, the most floral of the Raw Spirit fragrances, contains heady notes of Australian boronia, but the inclusion of sandalwood keeps the scent safely in unisex territory. The next fragrance, Bijou Vert, was inspired by Haiti, and contains premium Haitian vetiver sustainably sourced by local farming communities. This fresh yet warm scent marries notes of citrus and woods. A second Haiti-inspired scent, Citadelle, again employs the Haitian vetiver, but this time to a clean yet subtly musky and spicy effect. Winter Oak, a warm scent inspired by the oak-studded Chumash Lands, is the first of the scents to be inspired by Russell’s experience there. The notes of aged American Oak are front and center here, but rounded out with saffron, vetiver, and musk for an intriguing bouquet. All six of these fragrances are incredibly original and truly work together as a complete—but readily expandable collection. Possibly the best way to experience them is by buying the smaller, 7.5 ml samples of the entire collection, in a well-packaged rollerball format that allows more precise application to specific pulse points. Choose a single one or use several to create an olfactory journey on your body.